It's been years since we've experienced a proper jet stream-induced Windsday. Consider the jet stream, a fast-moving horizontal river of air at approximately the 300 millibar level (about 30,000 feet above sea level). Bernoulli's principle explains that, where the air is flowing fastest, the air pressure is lowest. It's a positive feedback loop because the jet stream sits over the regions of the lowest pressure and the pressure is lowest where the air is moving fastest. It's like a mountain pass that allows the air to blow through--only this pass can move and change course. High pressure systems are associated with warm and sunny weather. Low pressure systems are associated with 'disturbed', cloudy and stormy weather. Last night, I read several tweets from journalists remarking about the ripping Santa Anas. It didn't feel like a Santa Ana--too cold and not dry enough. I quickly took a look at the California Regional Weather Server Jet Stream Analysis webpage. Universal time/UTC/Z is 7 hours ahead of PDT so this was 23PDT 9 APR 2019. Note the peak of 136 knots right over LA in the jet stream analysis. We've lived with the Ridiculously Resilient Ridge for so long, we forgot what it feels like when the jet stream dips south over us. It seems like the satellite image overlay is no longer active at either CRWS or the Naval Research Lab links I provided earlier. Research funding scarcity and the privatization of data from public satellites was just too much to overcome. 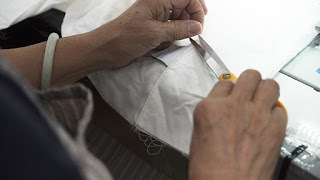 Kate at the Time to Sew blog (@timetosew on IG) asked me what I think about the arguments presented by Nina Marenzi on the Wardrobe Crisis podcast. I listened to the entire 36 minute podcast just so I can hear a few minutes of scientific tidbits. Nina Marenzi made some good points, but, there wasn't an opportunity for her to address the issues deeply in 36 minutes (!) while establishing rapport (talking about childhood pets) and establishing culture cred (music), etc. In short, she said that we have a crisis of topsoil. We are in danger of using up all of the world's topsoil in 60 years unless we change the way we do things. You get no argument from me on that one. Then we hit an uh-oh, when she segued into organic agriculture and biodynamic farming. We use labels as cognitive shorthand; organic is supposed to represent a sustainable way of farming. It's true that, on average, organic farmer tends to be kinder to the environment than conventional agriculture. But, if you have been reading my blog, you know that organic is no panacea. One problem is that organic farming does not necessarily preserve topsoil. The opening chapters of Michael Pollan's book, The Omnivore’s Dilemma: A Natural History of Four Meals, deal with how organic lettuce at Whole Foods is grown in northern California. The land is tilled, watered and weeds are allowed to grow. Then they plow the weeds under and repeat the process. Fewer weeds should sprout the second time. After plowing the weeds under a second time, they actually grow the lettuce. They follow this wasteful practice in lieu of hand weeding because they simply do not have enough labor to hand weed the enormous acreage required to feed our demand for organic lettuce. The damage wrought by that organic lettuce is enormous. They lost topsoil with each tilling. 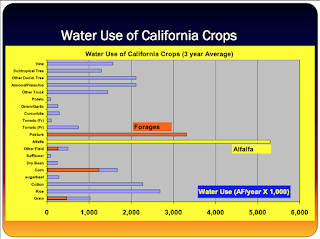 They pumped groundwater from a critically overdrafted aquifer to grow two crops of weeds and one crop of lettuce. Along the way, they used up 57 calories of fossil fuels to produce 1 calorie of arugula. Read Organic Pesticides: Not An Oxymoron for an idea of what I am talking about. The problem with EWG's Dirty Dozen is that they only test for synthetic pesticides (the ones not used in organic farming.) No one is routinely testing for pesticides used in organic farming that can be hazardous to the environment, farm workers, and consumers. You should read the entire well-researched article. Author Beth Skwarecki echoes the points chemist and farmer friends have made to me. It's preferable to buy from a farmer that sprays glyphosate once than from a farmer that sprays organic pesticides repeatedly. Insects can develop resistance to any pesticide, organic or synthetic. It's the repeated spraying that breeds pesticide resistance--superbugs and superweeds. A friend says that he sprays glyphosate once per growing season. 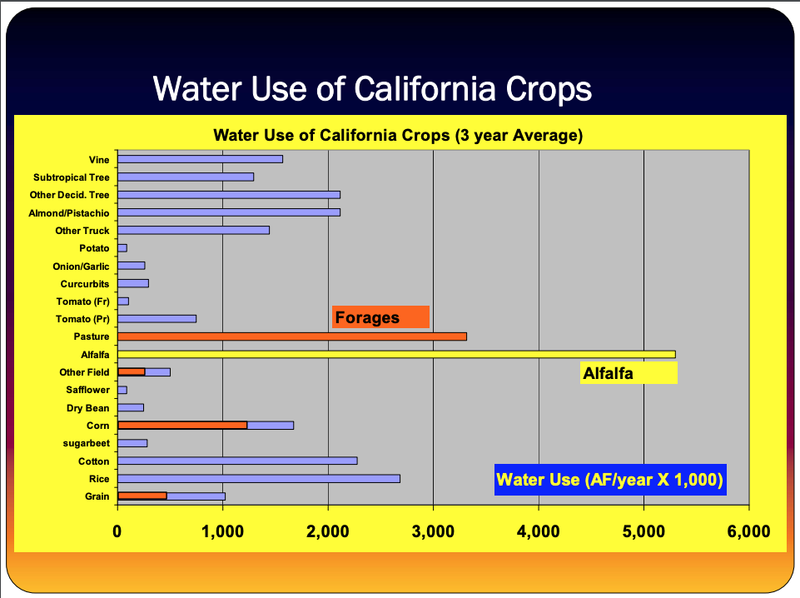 It makes a big difference in his farm's yield and water use. His orchard is too big to weed manually. But the glyphosate plus manual weeding of stragglers is working for him, even though he can't sell his fruit as organic. Did you know that in some parts of India, the chickpea borer has become such a big problem, that farmers cannot grow one of their primary sources of protein? The best hope for these farmers is to grow BT chickpeas, which are resistant to the borer. I'm not going to tell a farmer that they are better off starving than using GM technology. That flexible approach to production that uses technology to improve efficiency while being safer for the environment, the people working in agriculture, and the consumers. Let's get back to the podcast. Marenzi made solid points about how we should expand our market basket of fibers beyond cotton and polyester. She said that polyester makes up 70% of the fiber in global clothing production. 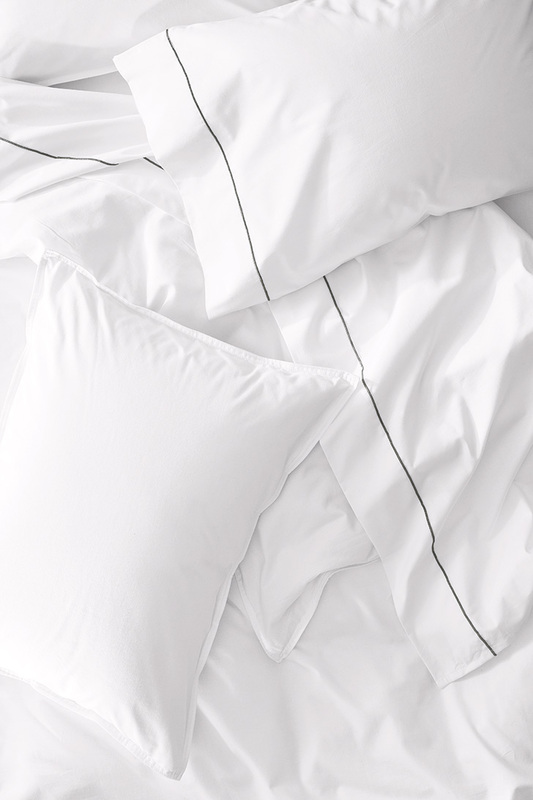 Cotton makes up ~23% and all other fibers make up about 7%. She said that we should use more linen and hemp, which grow readily with little chemical input and can grow on more marginal land. 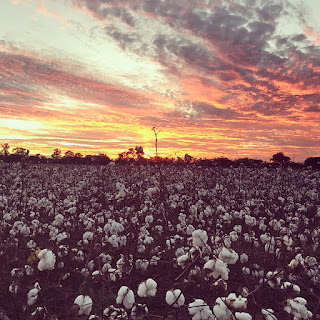 One of the big problems with cotton is that it uses up topsoil and water at alarming rates. It also requires good quality land and fresh water. GMO cotton can be engineered to grow in soils and with water that contains more salts than organic cotton can tolerate. In a world with 7 billion people (and growing), we need fiber crops that don't compete with food crops for land and water. They talked about fiber shedding in laundering and the amount of fibers that end up in the oceans and waterways. Acrylic sheds the most fibers of all. I expected cotton and natural fibers to also shed and find their way into the water. But I did not expect them to persist. After all, they are biodegradable. I thought wrong. The oceans are full of small fibers, natural and synthetic. This makes me glad that I live in Los Angeles, where our waste water is screened, treated and micro-filtered at a minimum. Some are even nano-filtered or undergo reverse osmosis and UV treatment to make them potable again. She mentioned the grave and irreversible damage done by cashmere production that I chronicled in The planetary cost of cashmere. They discussed problems with viscose/rayon production. Marenzi noted that viscose/rayon isn't the problem so much as the production process. 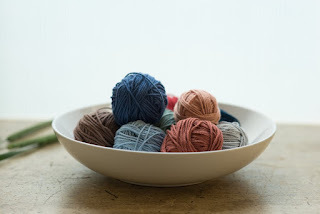 You have to soak the cellulosic fibers in strong chemicals to break up the fibers and then use more chemicals to get them to reform into fibers suitable for spinning into yarn. Wikipedia on rayon has a good summary of the processes. They mentioned the water use in viscose/rayon production, but didn't mention that the water footprint of viscose/rayon is based on the assumption that the water used in production is released into waterways and diluted to safe levels of toxicity. That's not what really happens. No one has uses that much water to dilute the effluent. Many producers just release it into waterways and let downstream users deal with the pollution. That happens often in countries with little oversight and laws. More responsible manufacturers recycle the chemicals and water (with high-tech equipment and applying lots of energy) in a closed loop process. Manufacturers that use closed loop processes label sell their products under the Lyocell, Tencel or Ecovero labels. Ambiance Bemberg rayon also uses a closed loop process. Please support these manufacturers as I do. They cost a little more for the consumer because they are not foisting the environmental costs to others. Marenzi also said that 80% of organic cotton grown today is rain-fed. 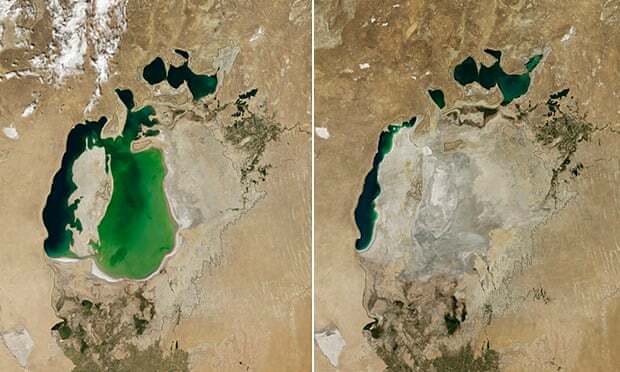 This is a positive development, but it's too late for the Aral Sea region or the Murray Darling River. I'm encouraged that the Gates Foundation is investing in GMO research so that farmers in poor countries will be able to take advantage of GMO's advantages without having to pay exorbitant and unfair Monsanto prices. Anyway, I thought the podcast was a long slog and made some good points but it was a poor investment of my time. For most people, reading is the fastest way to ingest information. Thank-you for reading and I hope I didn't take up 36 minutes of your life. I have a soft spot for Sharknado the movie. It's just pure, campy fun, especially for meteorologists from Los Angeles. * I also like that it highlights the relationship between our storm drains and the ocean. The real danger is underground, from seawater intrusion. The LA region gets about one third of our water from aquifers fed by rain that falls in the basin and is squeezed out of the sky by the mountain ranges that surround the basin. 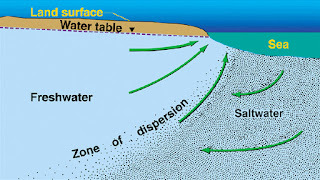 The aquifer is subject to seawater intrusion along the coast and in estuaries further inland. In the wild west days, anyone could sink a well and pump groundwater in the LA basin. This drew the sea water ever inland. Furthermore, some parts of LA subsided, as the Central Valley is sinking today, from groundwater over pumping. This was unsustainable. By the 1960s, the LA region became an adjudicated basin; people agreed who got to pump groundwater and how much. All pumping has to be publicly logged. 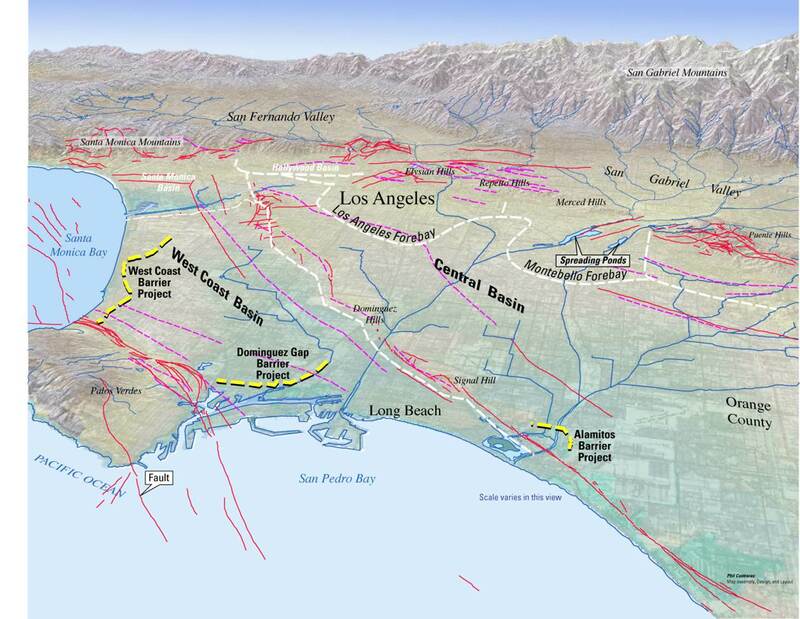 LA also created a ring of barrier injection wells whereby fresh water is pumped into the ground to push the underground toe of seawater back out towards the sea. Pumping groundwater out draws seawater inland. 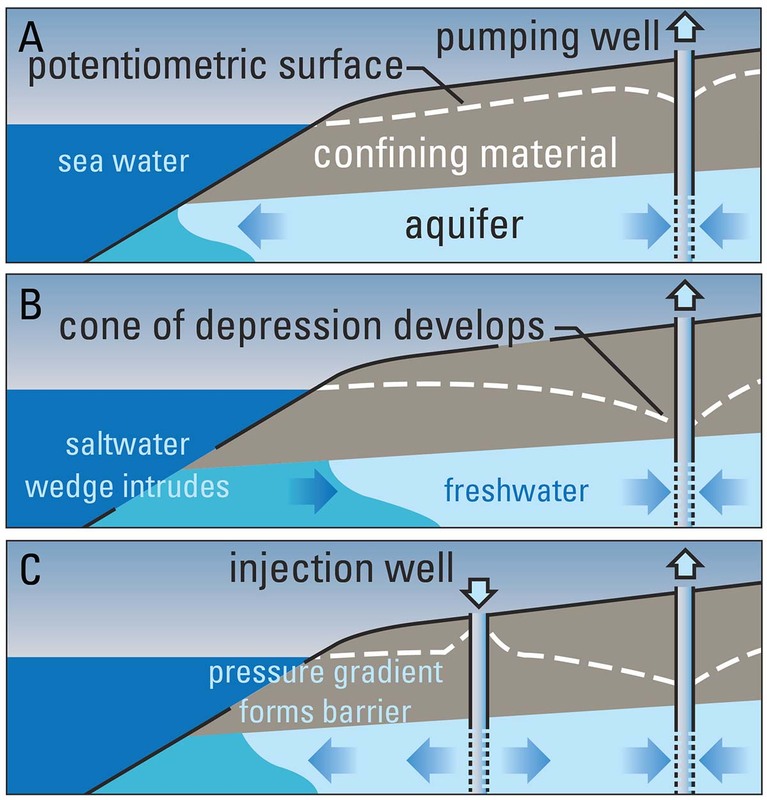 Injecting freshwater along the coast pushes the seawater back towards the sea. We used to do it with imported water from the Colorado River or the California Aqueduct. Now, we do it with sewage water recycled to drinking water quality at great expense in energy and dollars. This protects our freshwater supply. I had previously thought the main danger as sea level rises is that we will need more to put more (scarce/expensive) freshwater into the aquifer to push back the sea. In a nutshell, as a warming climate raises sea levels, the sea won’t only move inland, flooding low-lying land near the shore; it may also push water up from beneath our feet. That’s because for those of us living near the shore, a sea lurks in the ground—a saltwater water table. On top of that salt water floats a layer of lighter fresh water. As the salt water rises with rising seas, [UC Berkeley professor Kristina] Hill and others think, it will push the fresh water upward. In low-lying areas, that water may emerge from the ground. The result, Hill explained, will be that in places like Oakland, flooding will occur not just at the shoreline, but inland in areas once considered safe from sea level rise, including the Oakland Coliseum and Jones Avenue, where Hill and her students now stood, more than a mile from San Leandro Bay. In fact, she added, rising groundwater menaces nearly the entire band of low-lying land around San Francisco Bay, as well as many other coastal parts of the U.S. Most of us (including me, until I read this article) don't pay much attention to the small difference between the specific gravity (weight) of fresh vs seawater. That 2.5-4% difference in density turns out to matter quite a bit. If freshwater cannot percolate down through the heavier seawater, then it has no where to go but up. In the Boulder, Colorado floods of 2013, homes in low-lying places above clay soils had water come up through their foundations and their drains. The rainwater could not continue to flow downhill on the surface or percolate down through the soil. If there is enough water and hydrologic pressure, the water will go up. It came up for days and even weeks as the water flowed downhill underground and got trapped. Heaven or High Water explains a similar phenomena, Miami's "Sunny Day Flooding." Building sea walls against rising seas won't help when the water is moving underground. Since Miami is built on limestone, which soaks up water like a sponge, walls are not very useful. In Miami, sea water will just go under a wall, like a salty ghost. It will come up through the pipes and seep up around the manholes. It will soak into the sand and find its way into caves and get under the water table and push the ground water up. So while walls might keep the clogs of Holland dry, they cannot offer similar protection to the stilettos of Miami Beach. The horror story gets even worse. 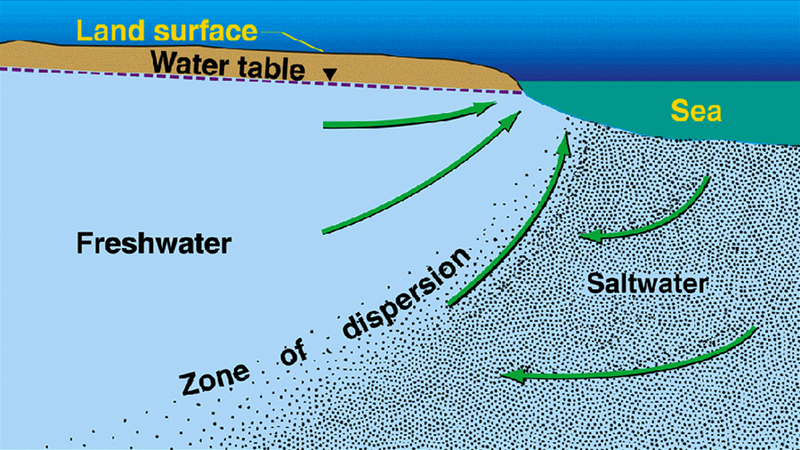 The seawater doesn't just retreat with the tide, it leaves salt in the soil. Rewet it with rainwater from above and you've made more salt water. Pour more rainwater on top, and the water has no where to flow underground. It has to come up to the surface. In the sequel, an atmospheric river strikes the region with intense rain and wind. Wind-driven waves pound the shore and push the seawater inland both on the surface and underground. Suppose we're successful in capturing much of the rain in the aquifer instead of letting it flood our streets and flowing out to sea. In East Oakland, on a residential street in front of a small park, Kristina Hill stopped and got out of her vehicle. She walked to the center of the street as a gaggle of graduate students emerged from their cars and gathered around her. It was midday, early September, the bright, hot sun directly overhead. Hill, a professor of urban and environmental design at UC Berkeley, had chosen the spot because when it rains heavily, water gushes up from storm drains here, forming filthy brown ponds. “That will happen more and more,” Hill said. Then she proceeded to describe a peculiar, almost apocalyptic future. Water will leach inside homes, she said, through basement cracks. Toilets may become chronically backed up. Raw sewage may seep through manholes. Brackish water will corrode sewer and water pipes and inundate building foundations. And most hazardous of all, water percolating upward may flow through contaminants buried in the soil, spreading them underground and eventually releasing them into people’s homes. The coup de grace will be the earthquakes, which, when they strike, may liquefy the entire toxic mess, pushing it toward the surface. Residents of Boulder, Colorado lived this nightmare. To solve the problem, cities dug through the clay layers to give water a way to flow down that did not inundate homes and infrastructure from above or below. Years later, those homes still suffer with elevated levels of bacteria and mold in their walls and foundations. People who live along the beaches in California are similarly vulnerable. Instead of building sea walls like Holland or excavating clay soils like Colorado, we need to push back the underground toe of seawater with as much fresh water underground as we can. We've built a largely impermeable city where the rainwater flows along the surface and out towards the sea. Low-lying areas already flood in the current scenario. Moreover, rain water on the surface does nothing to help push the seawater out. The more rainwater we can get to soak into the ground, the less (expensive!) water we need to pump into the injection wells. That will save us all money. It will also prevent rainwater from flushing out into the sea, laden with dog poop and motor oil. Collecting rainwater and letting it soak into the ground should be a win-win for both the people who live along the shore and the millions of people who rely on the aquifer. It would also be a win for the marine life that would appreciate us not dumping trash, bacteria and pollution into the bay. The Herondo Drain outfall is the largest storm drain in the South Bay Beach Cities and typically receives an “F” grade during rain events on the Heal the Bay Beach Report Card due to high bacteria levels, resulting in beach closures. The Hermosa Beach Greenbelt Infiltration Project is the highest priority project identified in the Beach Cities Enhanced Watershed Management Program (EWMP). The project will capture and infiltrate storm water runoff that otherwise flows through the Herondo Drain into Santa Monica Bay. Water quality grades for the Herondo Storm Drain are expected to improve to an “A” grade as a result of the project. The proposed location for the project is under the greenbelt between Herondo and Second Street. When complete, the project will be contained completely underground and will include the installation of California-friendly plant habitat along the greenbelt. Here's the map of the watershed and storm drain system that feeds into the troubled storm drain. 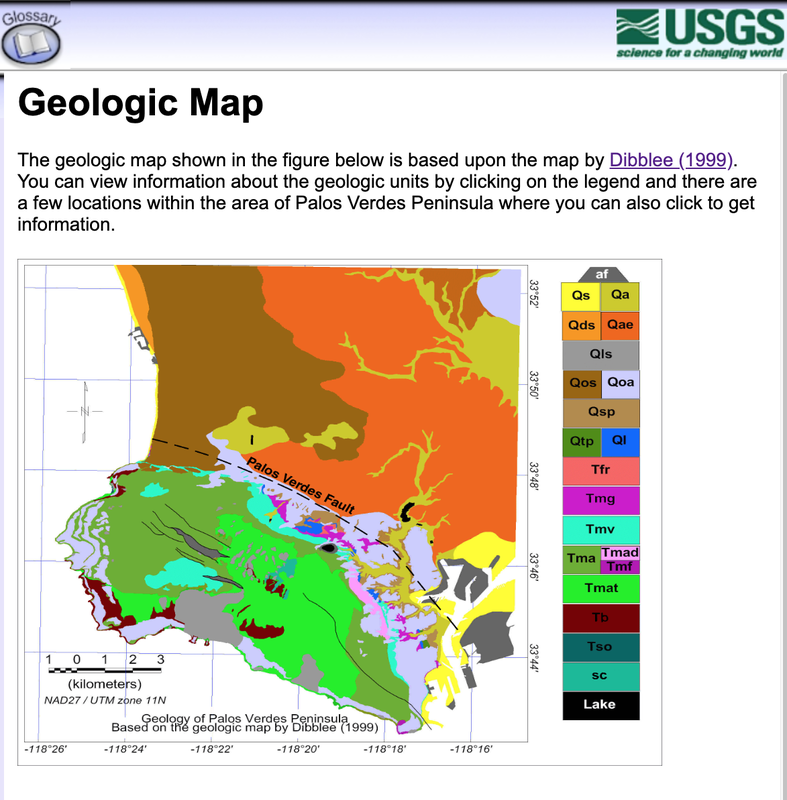 Here's a USGS map from 1963 with elevations of the area. The greenbelt follows the old streetcar right of way a couple of blocks from the beach, north of Herondo (the straight street ending at the north side of the harbor and the border of the cities of Hermosa Beach and Redondo Beach). The map shows the elevation of the greenbelt and park area as 30', but sea level has risen since then. 1963 USGS map of the area with elevation contours and benchmarks. Notice that the park and greenbelt sit on top of former oil wells. 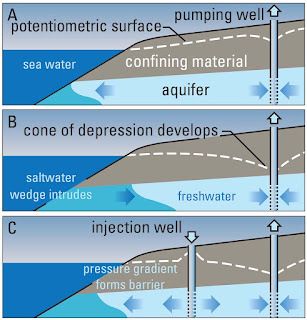 Imagine what interesting hydrocarbons would percolate up with the groundwater if it can't flow downwards due to encroaching seawater. The Hermosa Beach staff plan would have screened the trash out of the water from the storm drain, sent the "first flush" of rainwater, which tends to have the heaviest pollutant and bacterial load, to the sewage plant; filtered the remaining rainwater, and then spread it under the greenbelt in a network of pipes. The entire system would have been built underground and been invisible except for a few maintenance access points. The rainwater would have served the dual purpose of pushing back against the seawater and watering the landscaping in the greenbelt. This would have saved the city money in landscaping water and the neighborhood from the horror of watching water and a chemical and bacteria soup percolate up through the ground. Roughly 100% of the current vegetation is non-native invasive species such as ice plant, mustard, and (highly flammable!) eucalyptus trees. 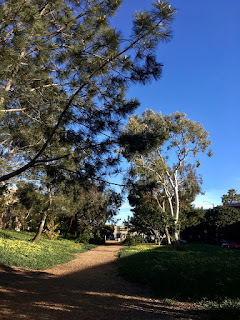 A peaceful place to jog and walk, but think how much nicer it would look with native plants. Can you see the yellow mustard blooming amidst the ice plant? The invasive and flammable eucalyptus tree? There is even some turf grass if you are playing environmental faux pas bingo. If the state and a coalition of city governments were willing to pay millions to make your home safer and give you free relandscaping with water, you'd think the neighborhood would support it. You'd think wrong. In fact, the opposite happened. “It looks like we're heading in the right direction to try to get everybody working together rather than having two separate groups to put as much pressure as we can on the City Council to do the right thing, to get it out of the residential area,” said Ira Ellman, who along with Jessica Guheen and Gina DeRosa, facilitated the Sunday meeting. 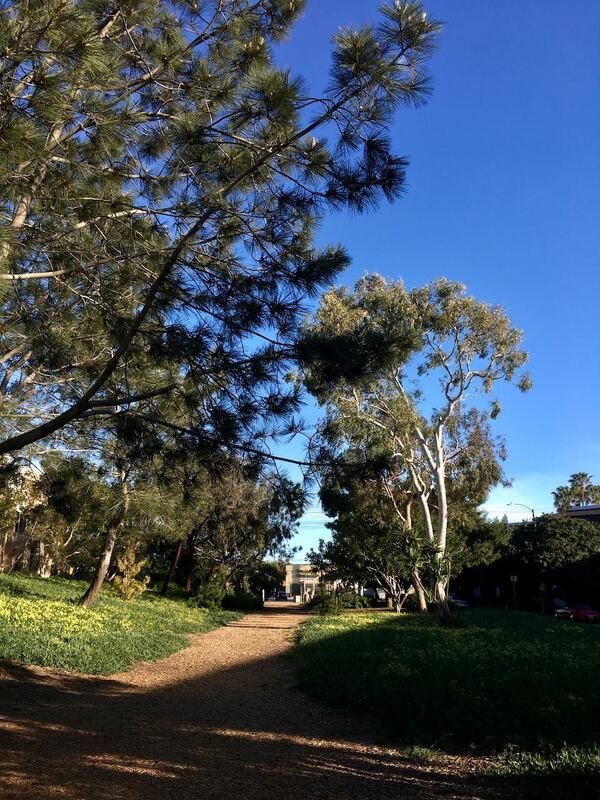 “The more I learn about this, the more I honestly think this is not the right project for Hermosa Beach,” said Guheen, who helped spearhead a 10-year renovation of South Park. Concerns included the removal of a third of the trees on the greenbelt; liquefaction; moving utilities that line the greenbelt; pollutants in the soil; street closures and traffic during construction; odor and noise coming from the system after completed; structural integrity of homes; as well as lawsuits on other projects against Tetra Tech, the project contractor. 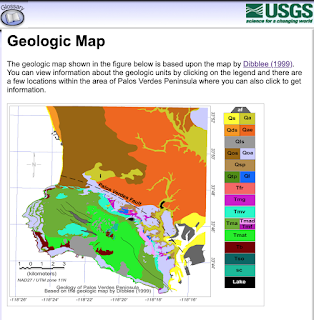 Check out this USGS geologic map of the area. Not only was the neighborhood built on top of the site of former oil wells, but it's built on Qds=loose dune and drift sand. Yup, those homes you see adjacent to the green belt in the photos above sit on loose sand and they claim this infiltration project will cause ground liquefaction. The horse is already out of the barn on that one. 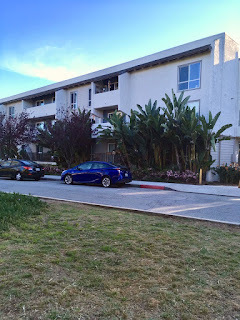 On March 26, 2019, the Hermosa Beach city council caved. They cancelled the entire project, jeopardizing the state funding and trashing years of planning. 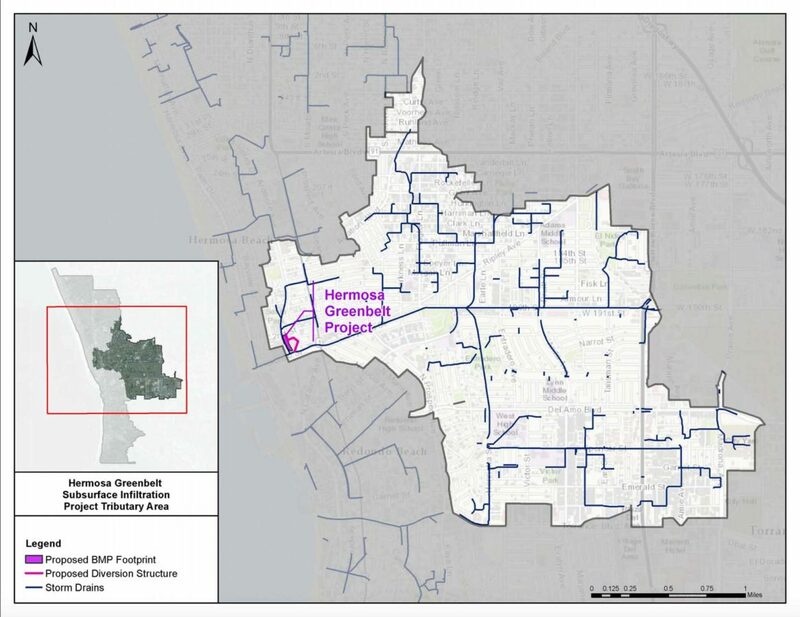 HB doesn't want the infiltration project anywhere within their city boundaries. By saying no to infiltration projects, they will continue to use more landscaping water in the short-term. In the longer-term, HB will have to find the money to build a network of injection wells and pay for the water to put in them on their own. 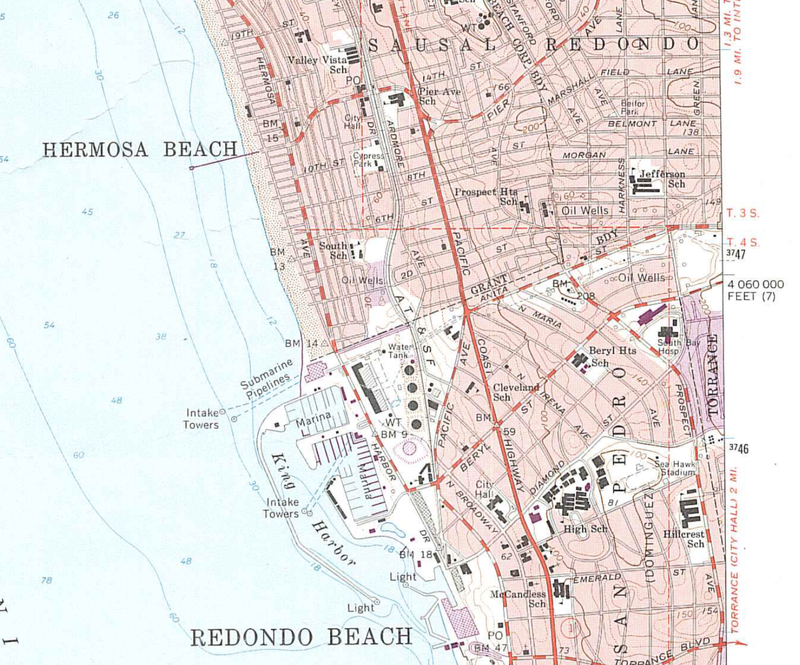 Redondo Beach is looking at some sites a few blocks away where the project can be built. 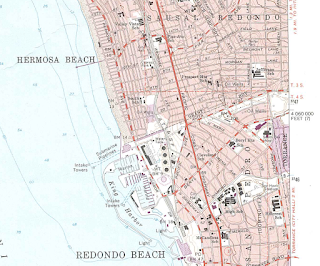 Redondo Beach has a history of welcoming infiltration projects such as the NRB library and the next to Aviation Blvd. This would mean more time spent planning another project from the ground up and possibly the loss of state matching funds. Construction is always painful, but the result will be a cleaner bay and healthier landscape. It will also protect the neighborhood near the beach as much as possible from sea level rise. We really need this project. "Los Angeles? I'm so sorry!" I'm glad that AOC and her allies are serious about combatting climate change and willing to commit the necessary focus and urgency to one of the biggest challenges we face. But, I hear people use terms interchangeably that mean very different things to different people. Here's an explainer to translate. Let's backtrack to look at the CO2 measurements at the Mauna Loa Observatory. The trend is upward, which is what is the main cause of global warming. Do you see the jagged sawtooth edge? Let's look at a close-up for the last year. See the scatter of the real data? Real data is messy. They take weekly and monthly averages of the measurements and add them to the long-term plot above. The jagged nature of the data means that, for part of the year, roughly May through September, raw CO2 counts are going *down* (net negative). 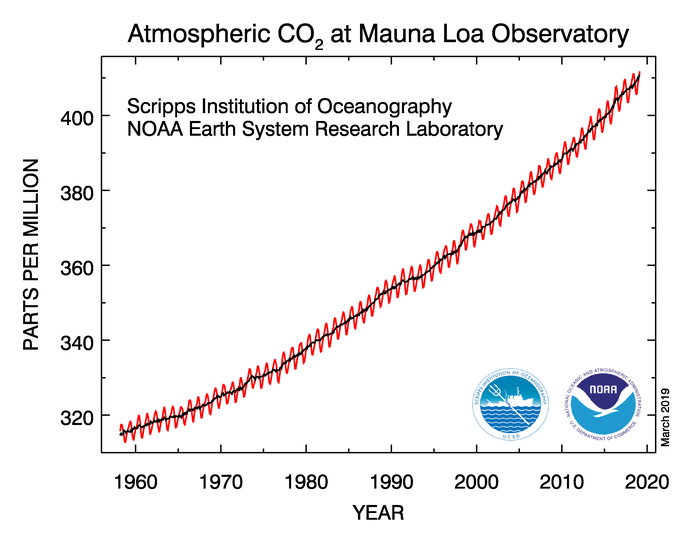 It's going down because the earth is taking up more CO2 than we are spewing out. There is more land, vegetation and human activity in the northern hemisphere (NH) than in the southern hemisphere (SH). During the NH (Boreal) summer, trees and crops are growing and we spew less CO2 because we don't need as much heating and lighting. 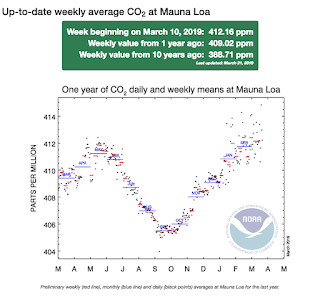 September to May, the cycle reverses and the planetary CO2 becomes net positive. While there are forests and cropland in the SH, there are much fewer. The trees in the NH slow down or go dormant, NH farms lie fallow, and carbon sequestration decreases on a global basis. Overall, the trend is up and net positive. When scientists say that we need to be net zero (aka carbon neutral) and that it is possible to do so, we are not saying we will stop producing CO2 altogether. We mean we can slow down our generation of CO2 to a sustainable rate that the earth can take up (sequester) in ways that are not harmful. Carbon neutral and net zero is not zero CO2 emissions. 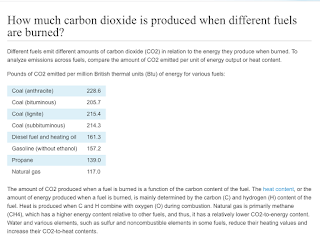 This is an estimate of the amount of CO2 emitted to generate one million British thermal units (Btu) of energy. (This is an average of all the plants in operation. Different plant designs have different efficiencies.) eia.gov, the Energy Information Administration, publishes more detailed statistics by state. Carbon efficiencies for different types of fuels. 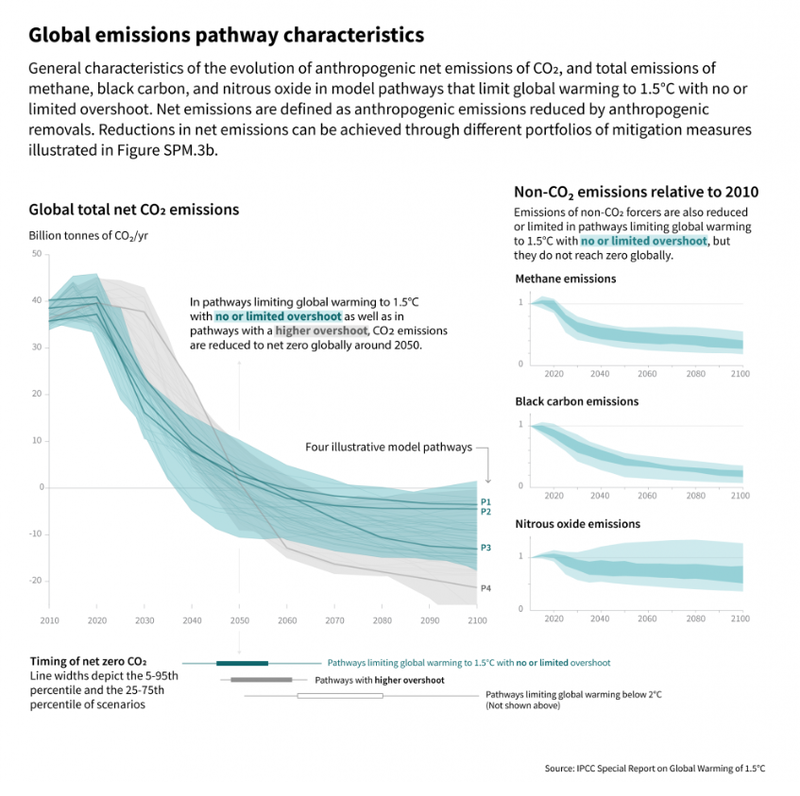 According to an IPCC report in 2018, we can contain the warming to 1.5 degrees Celsius if we halve our CO2 emissions by 2030 and go net zero by 2050. We already have the technology to hit our 2030 target. We just need to quit arguing and do it. Let me explain. 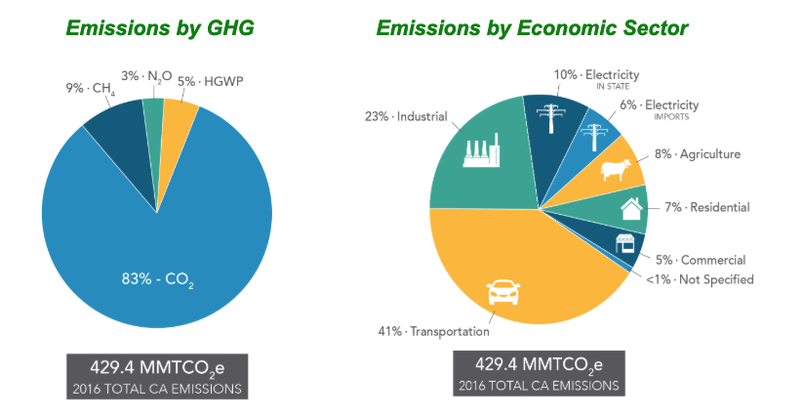 If we switch off coal to natural gas, we produce half our CO2 emissions right there. Coal-fueled power plants are closing across the US. We should replace them with wind and solar power plants wherever it is appropriate. Some places do not get the right type of winds (too weak or turbulent) or enough sunshine. We make up the difference with new, highly-efficient natural gas power plants as a bridge to the net zero future in 2050. Simple cycle gas plants produce electricity by burning natural gas to turn a turbine. They also send up a lot of waste heat into the environment which has its own problems. Combined cycle gas plants combine the simple system with a second steam engine that uses the waste heat to generate steam that turns another turbine that also produces electricity. Combined cycle plants produce roughly 1.5 times as much energy per unit of CO2 as simple ones. This sounds like another slam dunk, right? There are a couple of gotchas. "The EIA estimated that for a simple cycle plant the cost is about US$389/kW, whereas combined cycle plants are US$500 – 550/kW." Would you pay an extra 34% for 50% more CO2 efficiency? It doesn't make economic sense if we are looking at it purely from the point of cost of energy. But weigh it against a livable planet, and I think combined cycle is the better choice. The second gotcha is time. The wind stops blowing or the sun doesn't shine? A simple cycle plant can be pulled into production in minutes. A combined cycle plant takes 30 minutes or more to spin up to full production. 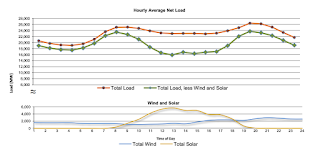 As we deploy more renewables in the form of solar and wind, the greater the instability of our power supply. That instability can cause major fluctuations of voltage and damage equipment, leading to blackouts. Ironically, the more we reply on renewables, the more we need power than can be brought on and off-line quickly. Simple gas plants are being used that way for now. 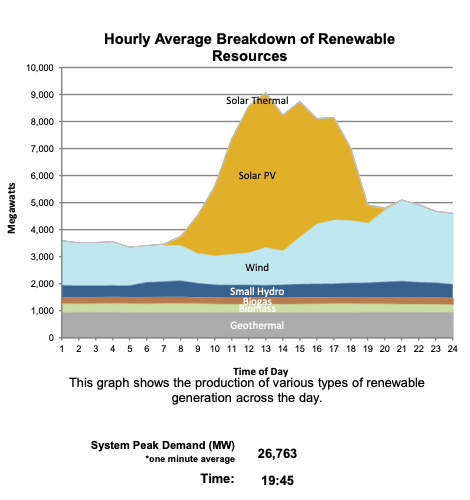 Take a look at CA renewable electricity production on March 20, 2019. This is all CA-only info from California ISO. 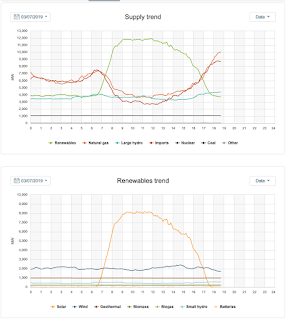 Notice the dips in peaks in the solar PV and wind curves. That's when the sun didn't shine or the wind didn't blow. This is averaged over the entire state of California, a large area with a diversified portfolio. Think what the curves would be like for smaller countries. Production is only one side. What about demand? There is a big gap between our current demand and renewable energy supply (the green curve above.) We should be doing much more to reduce our demand and to shift it to times when renewables are available. We also need to keep developing energy sources that don't spew CO2. Let's take a look at how CA got its energy on March 20, 2019. Imports is electricity imported from out of state and can be generated by any method. There are some regions in the state, particularly near the boarders that primarily draw electricity from neighboring states. We also export energy to neighboring states. Northern (rural) CA imports power from as far away as Utah and Wyoming, which is largely generated with coal (but rapidly changing over to natural gas.) Norcal also gets power from WA and OR, often hydroelectric. Southern CA imports electricity from several coal powered plants in Arizona, which are slated to close really soon. SoCal also imports electricity from a nuclear power plant in AZ. Thermal can be coal or natural gas. CA has shut down all of our coal power plants so this slice is entirely natural gas from power plants of different designs and efficiencies. Efficiency can be improved, which can reduce our dependence on imported energy. Nuclear used to supply 20% of California's annual electricity demand just a few years ago. Now it supplies 8%. If we don't invest in nuclear, it will soon be 0. 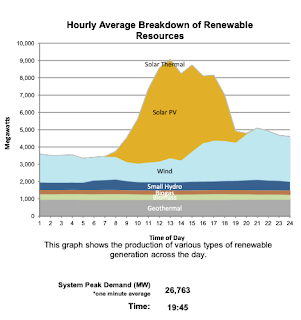 Shutting down nuclear, our primary source of night-time electricity (along with large hydro) is a large reason why we need natural gas plants. 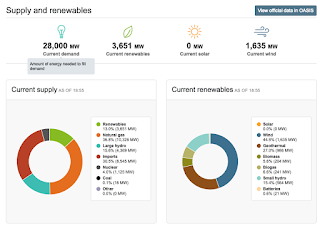 Renewables cover solar thermal (currently one plant, which is offline,) solar PV, wind, small hydro, biogas (our collective poop,) biomass and geothermal. March 20, 2019 CA electricity sources. Imports are electricity generated outside CA and can be from any source. Thermal is from natural gas. The slices that produce CO2 emissions are the light blue natural gas and a portion of the imported energy sources. 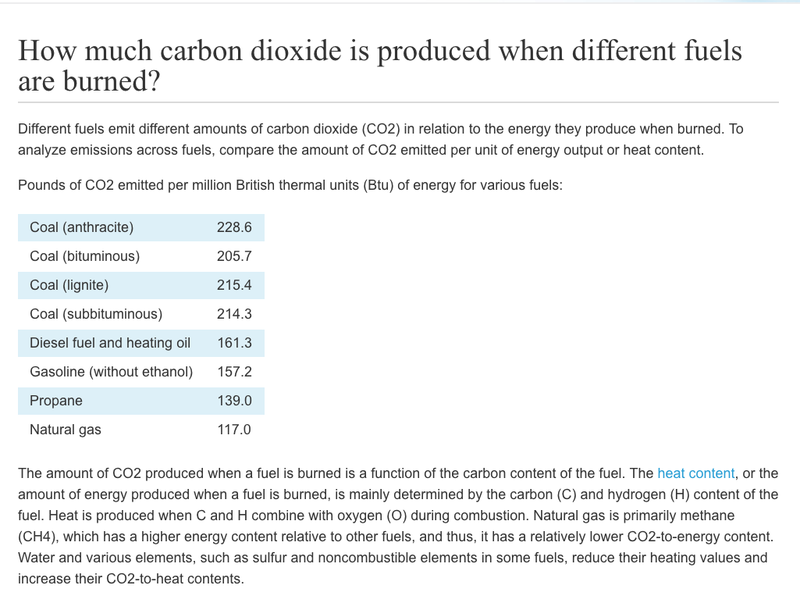 Nuclear and hydro also do not spew CO2. Large hydro has fallen out of favor and is not counted as renewable. Hydro is the original grid-scale battery. Water can be released when power is needed. Since the era when the US built most of our large hydro projects, we have learned a great deal about the harm that it can do. We have also learned how to mitigate some of the harm. Climate change is a threat to all river systems, dammed or not. We should definitely invest in small hydro and also move forward with new large hydro if the environmental and social costs are less than costs of climate change. Right now, there is simply no way to store enough energy to get us through the night without using natural gas. There are also environmental problems with batteries. What happens if lead acid batteries leak? Lithium batteries are more energy dense, but can spontaneously combust. Hydrogen is explosive. We should continue to invest in batteries and battery research but understand that they are not going to solve our night-time energy problem. We should also invest in making our natural gas plants as efficient as possible and use them as little as possible. If we demand that there be no new investment in fossil fuel-powered electrical plants, we cannot put scrubbers on coal power plants to remove black carbon (which is extremely warming), replace coal with gas, or upgrade simple gas plants to combined gas plants--all things that would greatly reduce climate change at low cost. If we stop using nuclear, as Japan and Germany have done, then we can actually increase our CO2 emissions. All of Germany's gains in renewable energy have been offset by the closing of their nuclear power plants. They are spewing as much CO2 as ever by replacing nuclear energy with coal. Is that the model we want to follow? Coal kills more people every year than nuclear energy in its entire history. Amongst scientists, support for nuclear energy is much higher than amongst the general populace. Some existing nuclear power plants were certainly poorly designed or sited (on coastlines or in seismically active areas.) Now that we no longer use ocean or river water to cool nuclear reactors, they can be sited in much safer areas and away from population centers. Do we have the political will? Is nuclear bad? Possibly. But I'm sure that climate change is a bigger threat to us right now. I believe that building new nuclear power plants in geographically safe areas are worth the risk, but can understand why some do not agree with me. We need to be flexible in our thinking and actions while maintaining a sense of urgency. For comparison, I'd like to show what happens during extraordinary weather events like the long-duration heat wave we experienced in July 2018. 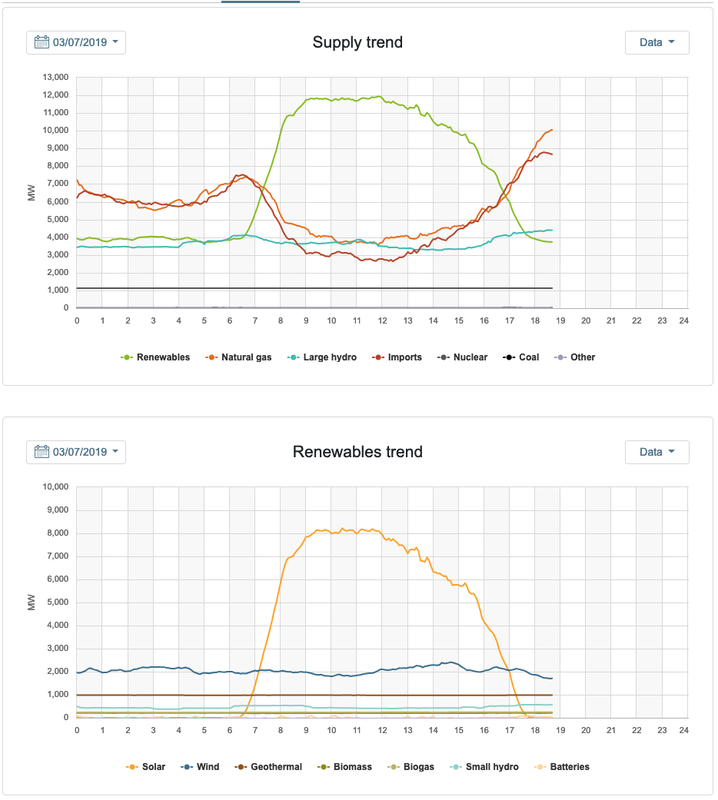 It was relentlessly sunny, so we had plenty of solar PV during the day. Ivanpah was in operation so we also had solar thermal power. Ivanpah was shut down due to economic reasons even though it generates about 10x the energy per unit of CO2 as old simple cycle gas plants. Should we make our energy decisions purely on economic factors without factoring the harm of CO2 emissions? Take a look at the scale on the left. California's electricity demand on July 25, 2018 was roughly double our springtime electricity demand this week. 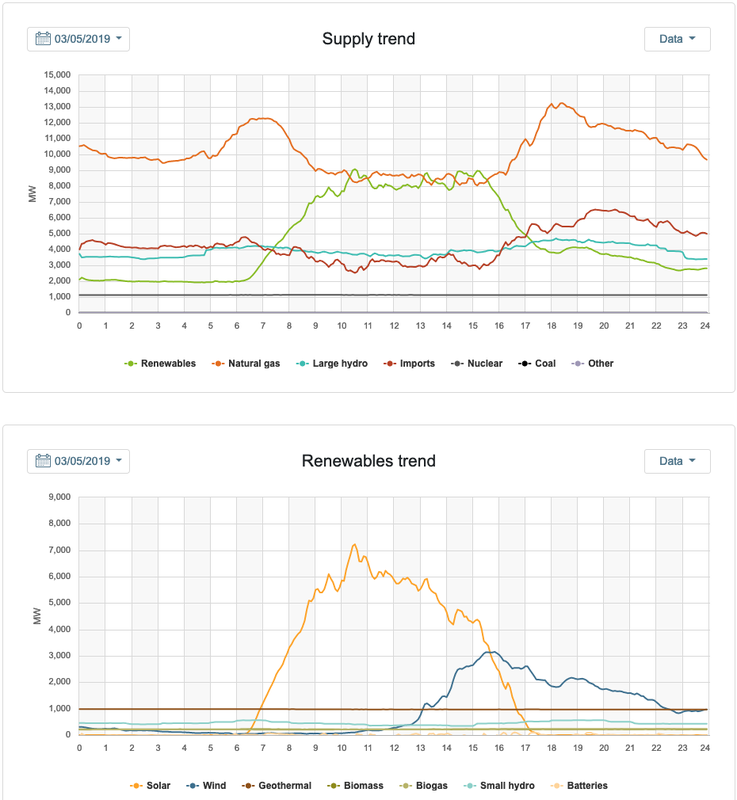 Renewables made a dent, but supplied only about a quarter of our electricity. There is more work to do. Just for fun, I checked California's electricity production and use right now. 61% renewables! During spring time, for wet years where water is available for hydroelectric, California can approach 100% non CO2-producing electricity sources during the day time. In closing, let's look at the big picture. 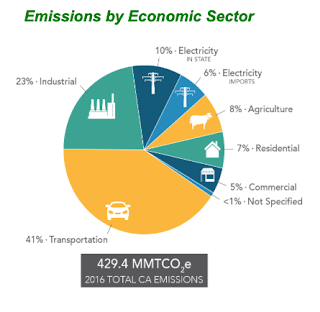 Electricity accounts for 16% (and falling) of CA's CO2 emissions. A large chunk of the industrial slice is due to cement production, largely to build infrastructure for cars and airplanes. Do we need to drive and fly as much as we do? Do we need as much stuff? Let's look at agriculture. Eat less meat and almonds. There is a lot of info about how to reduce the carbon intensity of diet and we'll save that for another day. The largest component is transportation. We can make huge reductions if we reorganize our society so most people don't need to drive. Invest in transit and pedestrian and bicycle infrastructure. Helping people live densely and well is the biggest thing we can do to reduce our carbon emissions. It would also reduce congestion, air pollution and stress. Why is it easier to imagine batteries made with unicorn poop than living next door to an apartment complex? Net zero for electricity is possible right now, with existing technology. We just need to deploy more of it, which means investing in more zero CO2 emitting energy sources and modernizing some natural gas plants. It also requires us to reduce/change our energy consumption habits. We don't need to stop using all fossil fuels today or even in 10-12. We just need to use a lot less of them and phase it out gradually. Do what you can today. Reduce a little bit more each year. 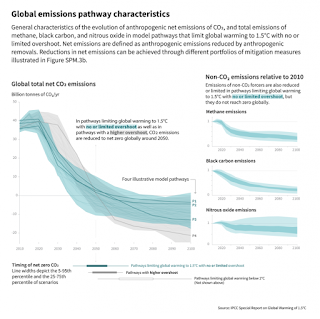 Carbon neutral or net zero is not zero CO2 emissions. It is only a reduction to the level that the earth can sequester the CO2. Don't fixate on just electricity production. Look at all the other slices of our carbon budget. The biggest and most cost-effective reductions will likely come from the biggest CO2 producing sectors e.g. transportation. Reducing demand is the fastest and most economical way to reduce CO2 emissions. It's fair to ask the people who are using the most to reduce the most. Market-based solutions are not enough. We need to add externalities to the equation and ask ourselves moral questions about fairness. There is much that I like about AOC's GND, but I also have reservations about some of her wording. I worry about getting attacked by zealots. * This post is part of a series. Has it already been 3 years since Nightgown-a-Palooza*? The teen has since declared that she is over nightgowns and wants pajamas. When we were in Joann's, she fell in love with this Star Wars themed Porg flannel. We both find porgs adorable so we purchased 2.5 yards, just as the pattern recommended. 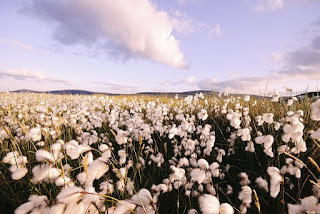 Flannel shrinks more than other 100% cotton fabrics due to its loose weave. I was courting danger by not buying extra to compensate. Sure enough, the legs of the pajama pants are just a bit short and I added knit cuffs to extend the length and keep out drafts. 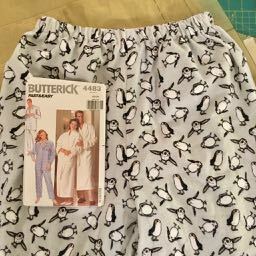 I'm going to spare you the sight of the droopy crotch of the PJ pants in OOP Butterick 4483. It looks indecisive. Are they MC Hammer pants? I put them in the out box, but then pulled them out. I might make the PJ top at a later date. 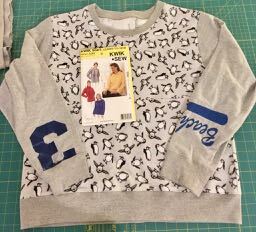 In looking at the oddly shaped scraps after cutting out the pants, I wondered if I could piece them together into two pieces large enough to cut the torso of a loose T-top like Kwik Sew 3262. I could. 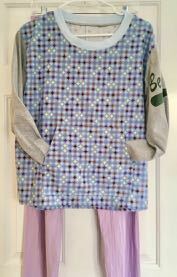 When people see that I sew with old clothing, they give me bags of old clothing. (My mother once gave me a bin of 26 T-shirts.) A mom cleaning out her adult sons' rooms found half a dozen T-shirts for their old baseball league. They had some rips or stains, but I was able to cut sleeves around the flaws. 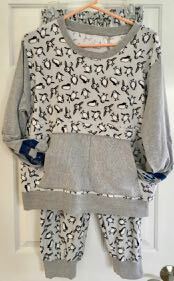 I added the same rib knit I used in the PJ pants, purchased at SAS Fabrics in Hawthorne. It's like I made something out of trash. Oh, I did. We are consuming several planets worth of stuff. It is definitely not sustainable or equitable. DD wears her clothes for years, until they fall apart. I sew her sturdy clothes with a mix of new and used materials. If we all did this, maybe the planet won't burn up. Anyway, she loved the porg pajama set so much, it was difficult to get it off of her to do laundry. I had a light purple pair of knit PJ pants that I wasn't wearing. I wanted to make another flannel top to go with it. After making a bunch of flannel bathrobes for everyone in my family, I had used up all my flannel. I stopped by SAS Fabrics and found this overstock/deadstock fabric. The top pattern suggests 2 yards of 60" wide knit fabric. I though that I could squeak by with 1 yard of 44" wide flannel if I pieced the back and mixed the crosswise and lengthwise grain. (I preshrank the fabric in a hot wash and dry cycle to reduce puckering from differential shrinkage.) There was even enough left over to make a pocket for her cell phone or cold hands. Second sleep set with new top and my underutilized knit pants made years ago. She liked the pocket so much, she asked me to retrofit the first set with pockets. There were no porg flannel scraps left. 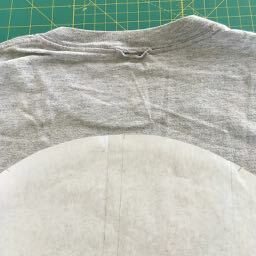 I cut up one T-shirt sleeve and then re-seamed it so that the hems fall along the side openings and then topstitched it on the top. It looks really cool. * In reading Nightgown-a-Palooza, I realized that there is was one more nightgown that I failed to blog. I rather like the way that I made do with short yardage for that one so I will post it shortly. I volunteered to lead an educational discussion about Green Energy and put it in context for Indivisible Beach Cities on March 27, 2019. Group members typically do assigned pre-reading and then a member leads the discussion. Somehow, the organizer advertised that I would be talking about Green Legislation. 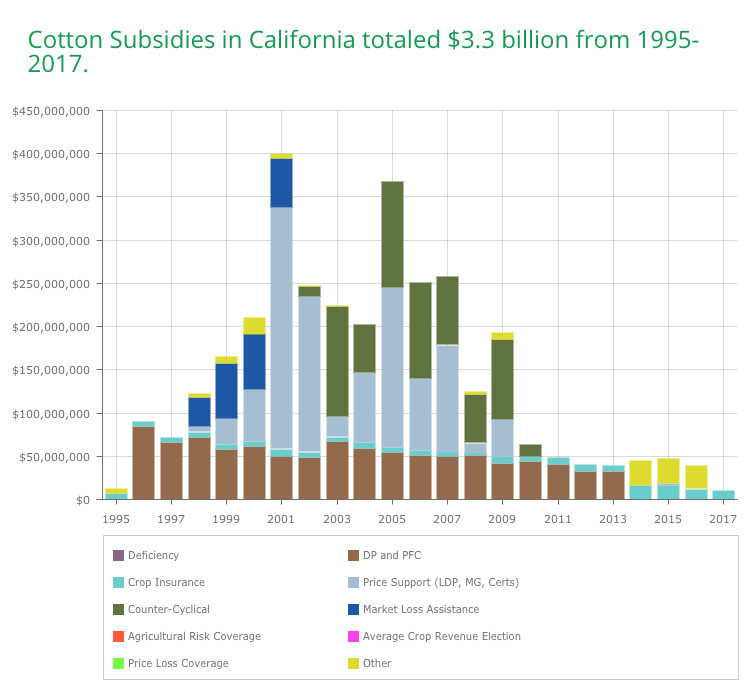 After some thought and research, I decided to talk about the Green New Deal and how it affects California quickly and then segue into my original topic of electricity fixation. Firstly, read the resolution on the official house website: H.Res 109 - Recognizing the duty of the Federal Government to create a Green New Deal. It's in committee (House Subcommittee on Energy and Mineral Resources) and may change form when it emerges from committee. That's normal and does not necessarily signal anything nefarious. Masochists may want to hate-read The Good News about the GND in the New Yorker. John Cassidy took Mark Jacobson's comments at face value, with no push-back or evidence. The Mark Jacobson whose calculations were so wrong and debunked by so many that he had to sue other scientists to shut them up. “Right now, we have about ninety per cent or ninety-five per cent of the technology we need,” Mark Jacobson, a professor of civil and environmental engineering at Stanford, told me. To make climate change less catastrophic, we need to reduce our total green house gas (GHG) emissions. I've read differing figures for differing outcomes. For the sake of this discussion, I'm suggesting that the people who are consuming the most make the most drastic reductions so that others may simply live. 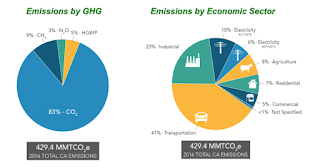 I'll use the straw man bandied about of 50% reduction in California, which is feasible if we cut our transportation GHG emissions by drastically changing our housing and transportation policy. It's the only way to get those emissions reductions using the technology we have now. Note that the largest sector is transportation. Simply, we need to drive and fly less, a lot less. The rest is fiddling while the planet burns. There is a lot of BS talk about changing our electricity grid to 100% renewable energy without nuclear, large hydro and even biogas. That was the topic I originally intended to talk about and I'll embed the links as I discuss them instead of in one list like I did for the GND. The US power grid is, by some estimates, the largest machine in the world, a continent-spanning wonder of the modern age. And despite its occasional well-publicized failures, it is remarkably reliable, delivering energy to almost every American, almost every second of every day. distributed energy resources (DERs): small-scale energy resources often (though not always) found “behind the meter,” on the customer side. Some DERs generate energy, like solar panels, small wind turbines, or combined heat-and-power (CHP) units. Remember the Enron (and other players) created California electricity crisis of summer of 2000? Remember the blackouts? Users around CA responded by installing diesel generators which caused hellacious air pollution and GHG emissions. This is the future we do not want. We need electricity to be available at all times to people who need it. 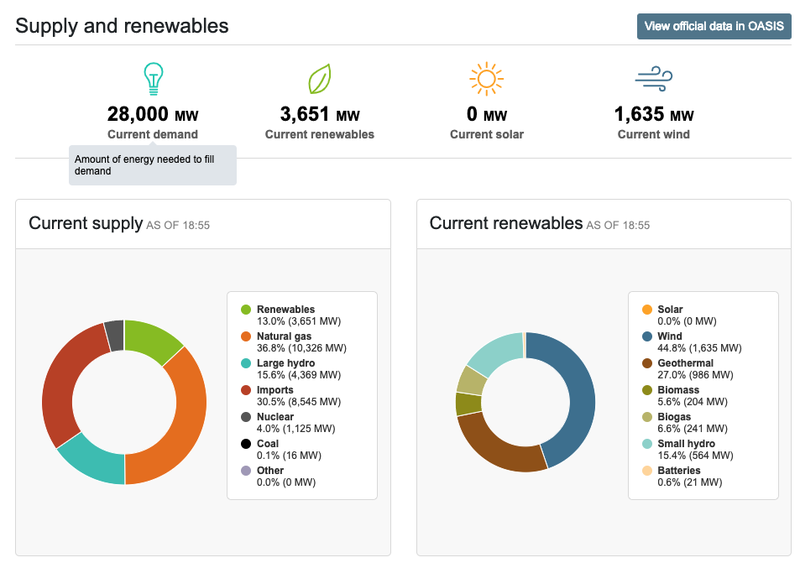 Deciding who needs it and how much is debatable but ensuring the stability of the grid is not. 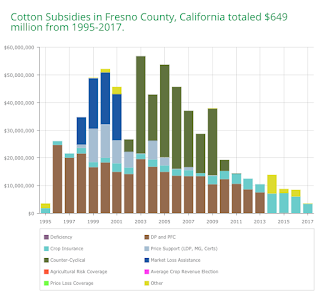 California and the Feds provide a lot of data for the curious. 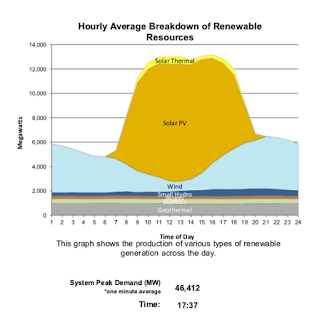 For starters, look at the California daily electricity supply for today. 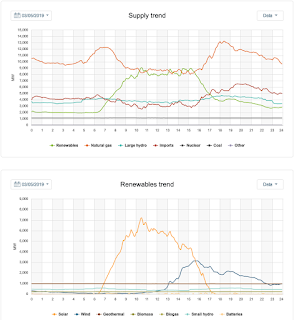 CA renewable and nonrenewable electricity sources for March 7, 2019. Today was mild and partly sunny. Check out two days ago, when a big storm blew through. 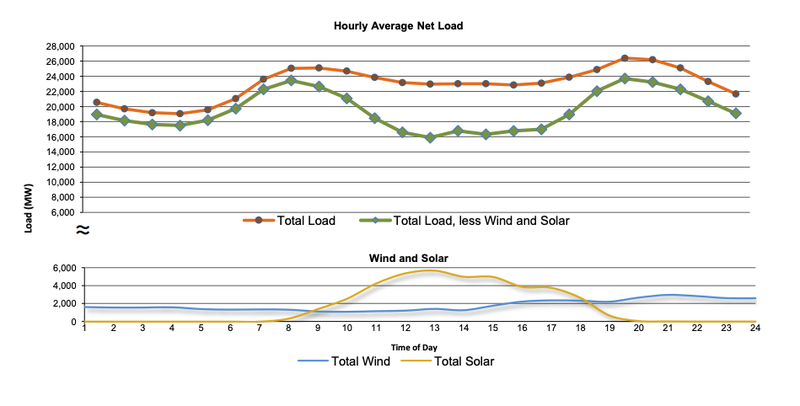 We had a lot less solar power and more wind in the evening, when the storm came in. Note that the scales are different from 3/7. Check out the wind blowing as the storm came in. The bad news is that the sun doesn't always shine and the wind doesn't always blow. For context, the CA transportation commission funds about $240M/year for active transportation (walking/bicycling) projects. This is why I say, invest in renewables, batteries and research, but spend the bulk of your money getting people out of cars. That's where you will get the most GHG reductions for your buck. We'll also reduce pollution and health care costs, too. Think class 1 separated (from cars and pedestrians) bike lanes everywhere so that we can move around quickly and safely. How about workforce housing so people can live near work and not need a car to get there? The average road speed of cars in Los Angeles is already slower than an average woman (me) on an e-bike. Think e-bikes instead of electric cars. They cost less and require a lot less energy, road and parking space. They also provide a bit of exercise. 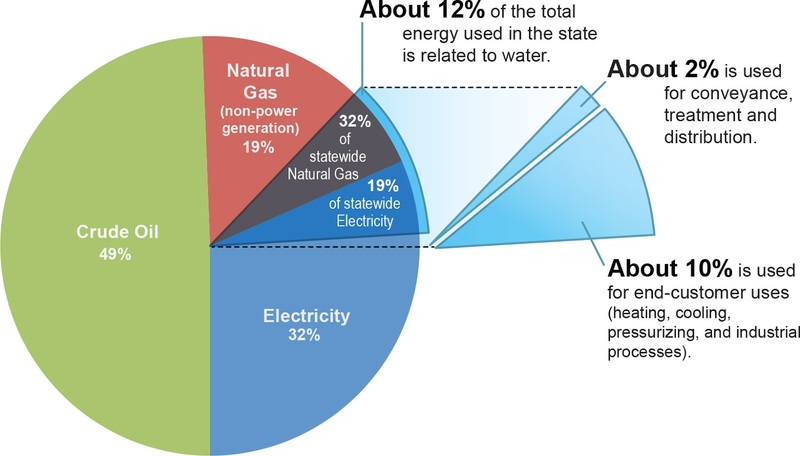 For California, we also need to keep in mind the Water Energy Nexus (optional, link provided for reference); 12% of California's total energy use is related to water. I'm going to talk about energy use and generation related to water in a later post. This post is already too long.